Neelam has been with IIF since March 2001 and brings to the position valuable experience for the prevention and cure of disablement. She feels very strongly about reducing Anaemia in women in India – 50% prevalence rate which contributes to the country’s Infant and Maternal Mortality Rates – and the need to mobilise funds for the implementation of IIF’s programmes. Neelam has worked in various capacities in the fields of social communications, research, education and training mainly with National Television (Doordarshan), Tata Institute of Social Sciences and the Aga Khan Education Service, India. 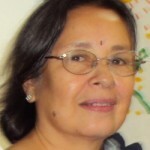 Neelam has been a Trustee of the Process Work Institute of India (psychotherapy and social action) and worked with Action for Good Governance and Networking in India (AGNI), mobilizing citizens from all classes towards civic action. An avid reader, Neelam practises yoga and has travelled abroad on various scholarships and attended several seminars on the many aspects of social development.